Are manufactured from a tube of rubber by inserting a mandrel into the tube and cutting the finished dimensions with a knife while the mandrel is being turned at high speed in a lathe type machine. 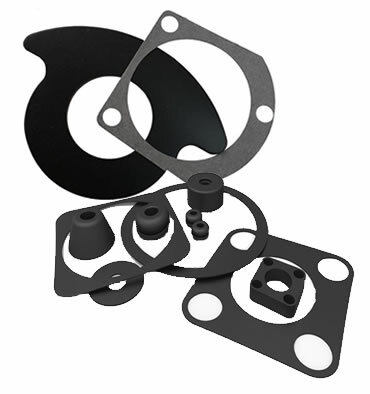 Lathe cut gaskets offer maximum cost-performance benefits in many applications and is usually the best choice where a static seal is needed. Its square or rectangular cross-section provides a wider sealing surface and superior resistance to compression set than molded O-rings. Lathe cut gaskets are typically less expensive than molded alternatives and is a great choice for high volume gaskets. Lathe cutting also is good when beveled edge gaskets or tight tolerance gaskets are required. The lathe cutting process is also a good choice when large OD gaskets or small ID gaskets are required. Filter gaskets and food grade gaskets can also be produced using this method.